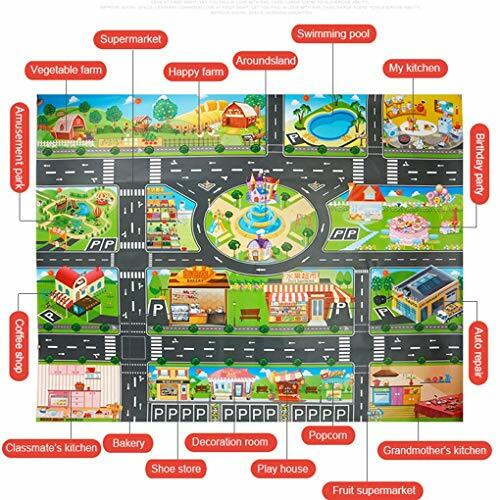 This colorful educational city map area road rug is perfect for children's bedroom or play area. The 130*100cm learning carpet size is great for a nursery, daycare, classroom and kindergarten. Your toddler or kid will love playing on this rug. It promotes fun make believe game play, interactive play and cognitive play. Goes great with toy cars like Hot Wheels and Matchbox which your kid can race through the streets. It is made of excellent quality polypropylene and it is low pile which makes the rug easy for cleaning. Perfect for travel, education, classroom centers, or speech therapy - light weight and easy to carry along! Attention!!! Please be aware of REPLICA.RXIN never authorize to any other seller. Please check carefully before checking out.